A number of people have been looking for relevant information on how to make coconut oil. There are several uses of coconut oil, apart from its use in the kitchen. While it makes your food and salad taste good, it is also used for treating dry skin and scalp, acid reflux, and as soap base and can sometimes be used for weight loss purposes. Pure coconut oil can be quite expensive, but if you need some challenging project that comes with fun, you can try to make your own coconut oil at home. All you need is a coconut, some simple tools and a good blender to produce your homemade coconut oil, which you can use for any purpose of your choice. One advantage that comes with producing your coconut oil yourself is the assurance that it is 100% pure with no additives. Get as much of the coconut outer shell shaved off. You can do this by scraping off the outer shell with your knife. Make sure the blade of the knife is always pointed away from you. Use a knife and cut the coconut into two. Get the coconut milk drained into a jar. Use a chisel to scoop out the flesh of the coconut and put it into a bowl. Get an accurate measurement of the coconut flesh you have. Add about 50% of more water into the bowl than the coconut meat. For instance, supposing you have about 2 cups of coconut flesh, you need to add about 3 cups of water. Empty the whole content of your bowl into your blender. Cover the blender and plug it. Leave the blender on at its chop setting for about 1 minute before switching the setting to blend for about 2-3 minutes, or until you produce a smooth, creamy homogenized paste. It is important to reach this level of consistency to make the coconut oil extraction successful. Get 3 layers of cheesecloth and have them placed on top of one another and use them to cover the bowl. Then pour out the coconut oil from your blender onto your cheesecloth. Gather the cheesecloth that contains the coconut in your hands and squeeze out the coconut milk. Throw away the cheesecloth with the coconut flakes it contains. Pour the extracted coconut milk into a hollow jar. Cover the jar very tightly and give the coconut milk time to ferment. Placing the jar in a dark corner of your home will enable you achieve this. Transfer the coconut milk into a warm, light corner for about 6-8 hours. The coconut oil separates from the milk during this period. To solidify the oil, get in chilled in a refrigerator for about 3 hours. 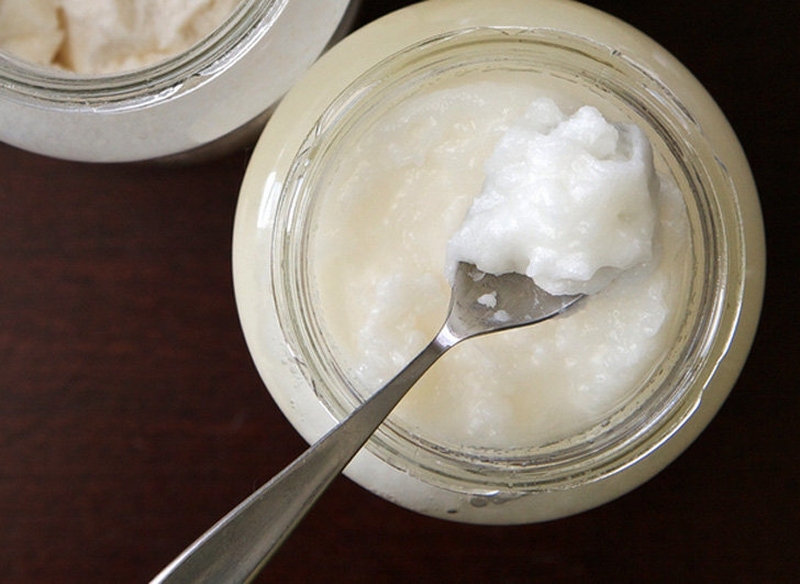 Use a table spoon and scoop out the coconut oil, put it in a lidded container. Give the oil time to thaw under room temperature. Your coconut oil is now ready for use. Begin with a dehydrated or dried coconut. Dried unsweetened coconut flakes are sold in grocery stores. Make sure the bag contains no other thing except coconut. To start with a fresh coconut flesh, cut the flesh into small pieces and dry them with a dehydrator for about 24 hours. You can dry this coconut flesh with your oven when the oven is at its lowest possible temperature. Cut the coconut flesh into tiny bits, place the bits on a baking mesh, and have it cooked at a very low temperature for about 8 hours, or until it has dried completely. If you are making use of store-sourced coconut, buy coconut flakes instead of the shredded ones. The shredded coconut will clog your juicer. Load the coconut into your juicer. Keep the dried coconut juiced in very small batches, since placing too much coconut at once will lead to the clogging of the juicer. The juicer helps remove the cream and the oil from the fiber. Continue the coconut processing until you have run all the flakes through your juicer. Process your coconut again. During the first attempt, the juicer won't be able to get all the oil extracted, so make sure you do it a second time to make sure every drop is retrieved. Store the coconut oil in a pot and keep the pot in a warm spot. Give it 14 hours to get the coconut cream to settle at the bottom of the pot. The pure coconut oil is expected to come up above the cream. Spoon the coconut oil into a new pot. The moment the oil and the cream has separated from each other and the oil solidifies, remove the oil from the first pot with a spoon and transfer it into a new pot. Your coconut oil is now ready for use.